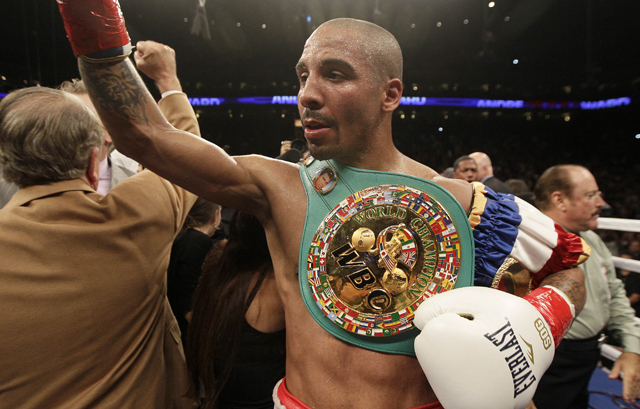 Super middleweight Andre Ward had a big night on Saturday in more ways than one. Not only did he retain his WBA and WBC titles with a 10th round stoppage of Chad Dawson in a career-best performance at Oracle Arena in Oakland, Calif., Ward also drew a whopping 1.3 million fans to his fight on HBO Sports, according to Nielsen Media Research figures. That came despite going head-to-head with a Showtime offering that featured Lucas Mattysse against Ajose Olusegun. That fight, which was at the Hard Rock in Las Vegas, attracted 344,000 viewers. It was also a major gain for Ward from his previous fight, in which he decisioned Carl Froch on Dec. 17 in Atlantic City to win the Super Six World Boxing Classic title. According to Nielsen figures, the Ward-Froch fight on Showtime peaked at 580,000 viewers. So, by jumping networks, Ward more than doubled viewership of his fights. His performance also continued a strong run for HBO, which has attracted a million or more viewers for each of its World Championship Boxing shows in 2012. Also, Saturday's second and final episode of "Chavez-Martinez: 24/7" on HBO turned out to be an unexpected hit, drawing 747,000 viewers. That made it the fifth-most watched episode in series history. It trails only three episodes of De La Hoya-Mayweather from 2007 and the debut episode of Cotto-Margarito. Julio Cesar Chavez Jr. defends his WBC middleweight title against Sergio Martinez on Saturday at the Thomas & Mack Center in Las Vegas on HBO Pay-Per-View.